What makes this American Sponge Cake so unique is its spongy texture that is so wonderfully light and moist. It has a sweet flavor and since it does not contain solid fat, it is the ideal cake for those watching their fat intake. This cake can be eaten plain, but my favorite way is with fresh fruit (or fruit sauces) and a dollop of whipped cream. 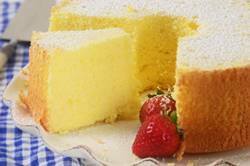 As with a lot of sponge cakes, this American Sponge Cake gets most of its rise from the air whipped into the eggs. The eggs are first separated and this is easier to do when the eggs are still cold. Then the egg yolks and some of the sugar are beaten until thick, light, and fluffy, which can take several minutes. This long beating time is necessary for it not only gives the baked cake its full volume, it also gives the cake its nice open grain. Next the flour, mixed with a little baking powder and salt, is sifted over the yolks and folded in. The egg whites are then beaten with a little sugar just until they are glossy and stiff. Care must be taken when folding the beaten egg whites into the egg yolk mixture to ensure that the batter does not deflate too much. The cake is baked in a moderate oven until springy to the touch and a toothpick inserted into the center of the cake comes out clean. This recipe uses an ungreased tube pan with a removable bottom to give the cake support as well as making it easier to remove. The pan is left ungreased so the batter can cling to the sides of the pan as it bakes and allows the cake to reach its full volume. The hole in the middle of the pan allows the hot air to circulate and reach the center of the cake. Once the cake is baked it is immediately inverted so the baked cake will maintain its volume and keep it from shrinking as it cools. You can serve this cake plain with just a dusting of powdered (confectioners of icing) sugar or with fresh fruit and softly whipped cream. This cake will keep several days or it can be frozen. American Sponge Cake: Preheat oven to 350 degrees F (180 degrees C) and place rack in center of oven. Have ready an ungreased two-piece 10 inch (25 cm) tube pan. Bake in preheated oven for 28 - 35 minutes or until a toothpick inserted into the center of the cake comes out clean. Remove from oven and immediately invert the pan (turn upside down) and suspend it by placing the inner tube on the top of a flat topped glass or bowl. Allow the cake to cool completely before unmolding (about one hour). Run a flat metal spatula or sharp knife around the inside of the pan and then remove the center core of the pan. Run the spatula along the bottom and center core of the pan. Invert the cake onto a greased wire rack. The cake can be served plain with a dusting of powdered sugar or with fresh fruit and softly whipped cream. This cake can be covered and stored for a few days, or it can be frozen.